It took me a long time to find out where he came from. The little prince who asked me so many questions never seemed to hear mine. It was thanks to the odd word, here and there, that everything was revealed to me. For instance, when he saw my aeroplane for the first time...he asked me: "What is that object?" "It is not an object. It flies. It is an aeroplane. It is my aeroplane." And I was proud to be able to tell him that I could fly. He cried out then: "What! You dropped down from the sky?" "Oh! That is funny!" And the little prince broke into a lovely peal of laughter which annoyed me no end. I like my misfortunes to be taken seriously. "What's that thing over there?" "It's not a thing. It flies. It's an airplane. My airplane." "What! You fell out of the sky?" "Oh! That's funny!" And the little prince broke into a lovely peal of laughter which annoyed me a great deal. I like my misfortunes to be taken seriously. 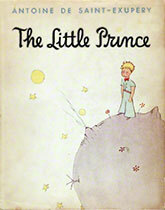 It was felt by some later English-language publishers that Katherine Woods's original 1943 translation of The Little Prince was too stiff. There is some truth to this. The occasional woodenness of her prose can work against the whimsicality of the story. For example, near the end of the story the pilot narrator despairs "for me, nothing in the universe can be the same if somewhere, we do not know where, a sheep that we never saw has—yes or no?—eaten a rose..." It's a passage that poetically links the personal and the cosmic, but you have to stumble your way through this particular wording. However, Woods's prose also gives a slightly old-fashioned feel to the story, reminiscent of the childhood fiction many mid-twentieth century readers had cut their literary teeth on. It could make for a pleasant sensation. In any case, for five decades the Woods translation was the one most English speakers were familiar with and the one that helped make the story a worldwide modern classic—so how bad could it have been? The 1995 translation by Irene Testot-Ferry for Wordsworth Classics eliminates some of the stiffness. It's not exactly an updating of the style though, as many of the slightly ponderous constructions are retained and a few are even added. The biggest problem with this edition though is not with the translation, which is fine, but with the publisher Wordsworth. Its "classics" line, including Saint-Exupéry's fable, is produced sloppily. At least one glaring typo mars Little Prince for me and the illustrations are in dull black and white. On the plus side though, you can usually pick up Wordsworth editions very cheaply. Richard Howard ignores the Testot-Ferry job and, in a translator's note, refers to his 2000 translation as only the second. It is the best translation at any rate—unobtrusively colloquial. He uses contractions, where appropriate, he drops every unnecessary "that", and he modernizes punctuation and paragraphing. This edition by Harvest Book-Harcourt Inc. (essentially the same publishers as the 1943 translation) is also the most beautifully laid out. The illustrations are richly coloured. All else being equal, Howard's is the version I would buy. Fortunately it is the translation most readily available these days. Unfortunately it is pricey, even in soft cover. But each of these three translations offers the same take on the story, with only minor stylistic differences. You'll get the essence and the flavour of The Little Prince from any of them. So pick up whichever one—new, used or at the library—you can find. It's the adult thing to do.